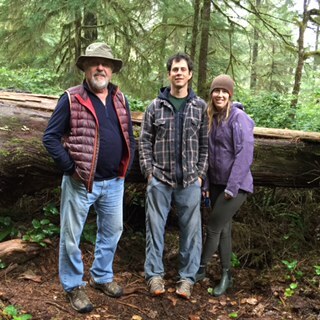 I’m proud to say it was my dad’s idea, but a couple weeks ago, Dan and I took the Frey-parents to our beloved Walbran valley! The four of us crammed into Hobo-the-van and squeamishly endured the bumpy, winding, sickening forest service roads which lead to one of the last (semi-)intact havens of old-growth trees. Mom and I are both sensitive to car-sickness, and we were swapping the coveted front seat. “It will all be worth it mom. Trust me…I keep coming back,” I explained between bouts of nausea. I’m not sure if she believed me, but she endured it in order to go where her family goes. What a mom! We rolled in sometime around 10:00pm. The plan was for us to give up our home for Mom and Dad, and to pitch our tent. I have gotten so soft lately with my pillow-top bed…but anything for the parents right? Turns out we forgot the tent pegs, so we sheepishly crawled into the van to bunker down with the family. We popped-the-top, set up our bed “upstairs” and settled in for bed. Tomorrow we get to show off the forest to my parents! I was excited. Saturday was a little bit overcast and drizzly, but nothing out of the ordinary for a temperate rainforest. This area is green and lush for a reason, and I’d like to keep it that way, even if it means a bit of precipitation. We hiked for several hours surrounded by flora and fauna galore. The Walbran worked her magic (doesn’t she always?! ), and we were inspired, once again, to care. Sure, we can care from the safety and comfort of our hearts in a wow-this-is-great-but-oh-well-if-it’s-not-protected kind of way, but that’s not the kind of caring that the Walbran inspires. She inspires action in a variety of ways – discussion of alternative and sustainable forestry, how to re-wild these ecosystems, and how to put pressure on our society and our government. These conversations are like sweet music to my ears! And who’s to say that this is only for “the hippies?” What does that name even mean anyway? Dan and I have met so many people from so many walks of life who are devoting time, energy, and heart to saving this particular area of forest. We’re not wacko or obsessed with a lost cause. We see feasible, and necessary alternatives. The way that forestry is done today (and in the past) is a dying way of life – a dinosaur of sorts. We need to switch to second-growth forestry (as if this hasn’t happened yet! ), and leave the last measly bit of old-growth alone. Soon there will be none left, and then what? We’ll switch to second-growth. Why wait until it’s all gone…? Mom and Dad loved the Walbran. My heart was full of pride as they ooo-ed and ahh-ed at this and that, and my heart broke every time they pointed out the nearby clear-cuts. 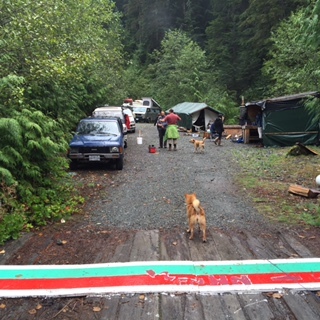 I was also happy to introduce them to the community, as we shared the camping space with at least 30 other volunteers and campers that weekend. Campfires were shared together, food was passed around, and everyone was welcome to join in on hiking and conversation. This place brings people together. Sunday brought glorious clear skies! 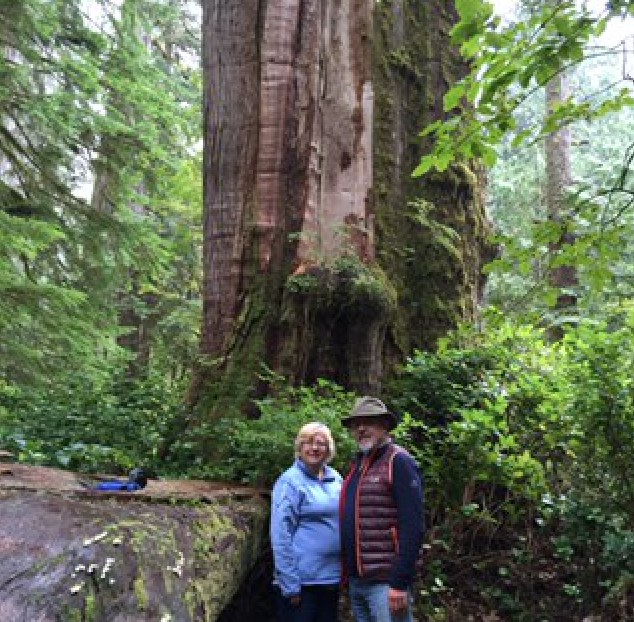 We headed over to the Castle Giant – a towering cedar tree. The hike is rugged, but Mom and Dad endured it with smiles and continued awe of their surroundings. On the walk back, Dan and Dad plunged into the chilly, rushing river water, and Mom and I, hesitantly followed suit. A weekend hi-lite for sure! 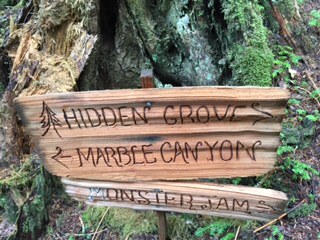 Upon leaving the Walbran, it was clear to me that there’s something sacred about investing time and heart into places and causes. Sure, we live a semi-nomadic life in our van, but we are often drawn back to the same places. We fall in love. We want to experience that feeling again. We want to see those people again. We want to belong to something bigger than ourselves. Sure, it’s fun to be nomadic in a sense that one is always seeking out NEW adventures and ticking off more destinations to share on an Instagram account. But there’s something to be said about investing in community and in places. We may not end up staying on Vancouver Island forever, but while we’re here, we hope to contribute to things that matter to us, and share those with whoever will listen. 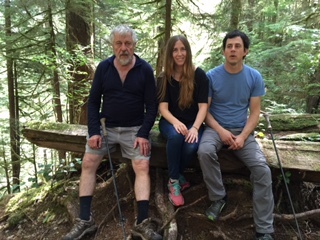 Thanks Mom and Dad for being so rad – for enduring the roads, cramming in a van, hiking for hours, and for adding even more value to my plethora of reason why I love the Walbran. I learned that to share her is more valuable to me than to hoard her in my heart. This place is special. It’s rare. And if we continue in our ways, it’s dying.